I read the text in horror and disbelief. How could he be gone? He was the picture of potential. So much going for him. He had been through so many challenges and had come so far. Achieved so many accolades. How could his world have crumbled so low that taking his life became the answer he turned to? Shockwaves ripple through the core of my heart. A landslide of sorrow. All who knew and loved him grieved. In our homes. On social media. In our conversations. In our prayers. In our hearts. We grieved deep with a pain that stings fierce. We grieved for his family, for the empty seat at their dinner table, and the empty gape in their hearts and home. We grieved for his friends, our children, his teammates, and our community. We grieved because death hurts. As we gathered in community to celebrate his life many stories were shared. In the sacred sanctuary of God’s presence, we were reminded that God is the healer of the broken. We were reminded that death is not the end for those that place their faith in Christ. We were reminded to cherish those we love and to keep our eyes wide open to the needs of those around us. The pastor painted a canvas of Hope as he spoke. Each word a stroke of truth. A smattering of grace in full and vibrant color. He shared from the Word of God about the Word made flesh: our Hope, Jesus. And then this... “Our friend did not die of hopelessness, he died of brokenness." How does one who is surrounded by a community of love feel broken to the point of death? To the point of thinking that suicide is a solution to the pain? I struggled to breathe as I think back on this tragedy. I consider the lives I love that are tortured by depression and sigh inwardly. The weight of it all still sits heavy on my heart. Inwardly I speak to the Father. I remember pouring my heart out to the Comforter and sensing His peace in the middle of the grief. The burden remains, but the pressure of it is lightened in His presence. And I’m reminded that God’s strength comes to me as I yoke myself to Jesus and allow Him to share in the carrying of my grief. In doing so, I am locked into His power that walks with me step by step through every struggle. When life is jagged and darkness taunts us like a bully, how can we see beyond the despair that grips us? I don’t have a simple list of answers, but I do know this: when grief runs deep God’s comforting love runs deeper still. The peace we long for and the rest we are desperate for will always be found in the arms of Jesus. And those arms are constantly reaching out to us. This is the invitation Jesus gives to each of us. If you find yourself in a place of unrest… if you are trying to sift through a landslide of soul sorrow… if you’re carrying a heavy load, will you turn toward Hope and accept His invitation right now? Dear Lord, Please help me bring my grief to You. Thank You for being a God of hope and healing. Remind me of the peace and plans you have for me. Read Isaiah 41:10. What two things does God not want you to do? Why? What three things does He promise to do for you? How will these promises affect the way you deal with your challenges today? Who is one person you know that is struggling and in need of encouragement right now? How will you encourage her/him? 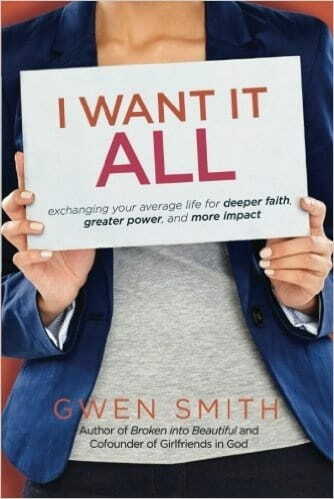 Gwen Smith is a speaker, worship leader, songwriter, and author of I Want I ALL, which includes a Bible Study Guide right in the back of the book; no extra purchase required. I WANT IT ALL is easy to read yet contains compelling and challenging content. You'll connect with the stories, probably dust off a few heart dreams, think bigger thoughts of God, laugh and smile a lot, search your soul, and even cry a little ... because each page lovingly directs you to the personal grace and truth of JESUS.